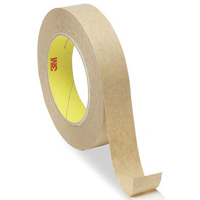 Some call it snot tape aka clear butyl but this is the actual description - Scapa 4450 is a versatile acrylic transfer tape with a high tack permanent adhesive recommended for all permanent bonding, mounting, laminating and splicing applications where high temperature performance is required. Scapa 4450 is suitable for bonding a wide variety of similar and dissimilar substrates, imparting a self adhesive feature to such items as labels, nameplates etc. It is also ideal for mounting photographs and posters. Scapa 4450 can be used as a splicing tape for film, foils and papers except for siliconised ones. We say that snot tape is a sticky rubbery adhesive that is handy for temporarily mounting things. Prices in RED are Canadian Dollars. Prices in BLUE are US Dollars. Please Note: Not all items listed in the catalogue are regularly stocked. Please call or email to check current inventory levels. We are not limited to the products on this site. Please call or email us and we'll do our best to locate your product.